After finishing a five-game playoff run with zero goals and two assists, frustrations with Johan Franzen were at an all-time high. Wings’ fans in the past had always made excuses for the man known as “Mule”. “Oh, when he’s hot, he’s nearly unstoppable”. “When it comes playoff time, he’ll go back to dominating again”. However, the 2013-2014 playoffs were the fourth consecutive playoffs where Franzen failed to make a noticeable impact. In Franzen’s first four playoff runs, he played 79 games and scored 34 goals and 66 points. In his past four playoff runs, Franzen has played in 32 games and recorded seven goals and 12 points. His level of play has dipped dramatically in the regular season as well. With Franzen under contract through the 2019-2020 season at an average annual value of $3.95 million, the Wings have got to figure out a way to get him going. A trade and a buyout are likely out of the question due to the cap recapture penalty/buyout penalty that is tagged to his contract. That led me to look at what has changed about Franzen’s game and what the Wings do to maximize his efficacy. 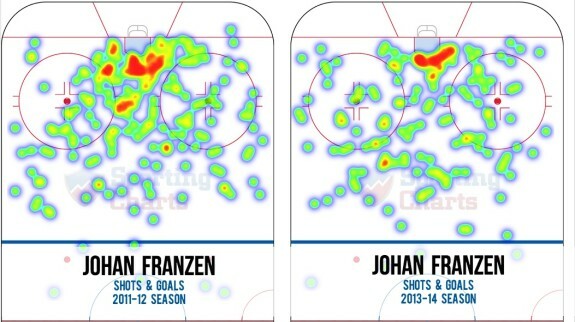 Johan Franzen has been an enigma of sorts over the past few years. Can he locate his scoring touch? From SportingCharts, I was able to obtain a heat map of Johan Franzen’s shots and goals from the 2011-2012 season and the 2013-2014 season. The 2011-2012 season was likely Franzen’s best season, as he scored 29 goals, 27 assists, and was a consistent force throughout the season. From this chart you can see how Franzen has shied away from the front of the net and has started to take shots from a further distance and worse angle. Franzen was far more willing to go to the front of the net and into the slot back in 2011-2012. When you look at the 2013-2014 season, you can clearly see large white areas in the slot. Mike Babcock and his staff will have to urge Franzen to get back to the front of the net, especially on the powerplay. This heat map specifically looks at Franzen’s shots and goals while on the powerplay. The left chart is 2011-2012 and the right is 2013-2014. You can clearly see that Franzen no longer heads to the front of the net on powerplays and instead has resorted to shooting from further out. SportingCharts reports that Franzen’s average shot distance on the powerplay in 2011-2012 was 20.91 feet compared to 29.55 feet in 2013-2014. The decreased shooting distance paid off as Franzen scored 11 times on 43 shots in 2011-2012, compared to just seven times on 41 shots in 2013-2014. Babcock and his staff will have to consider pushing Franzen back to the front of the net in a role similar to what Tomas Holmstrom used to do. Franzen was moved away from the front of the net the past two years because he has a fantastic shot, but this chart shows that Franzen was more effective when stationed in front of the net. 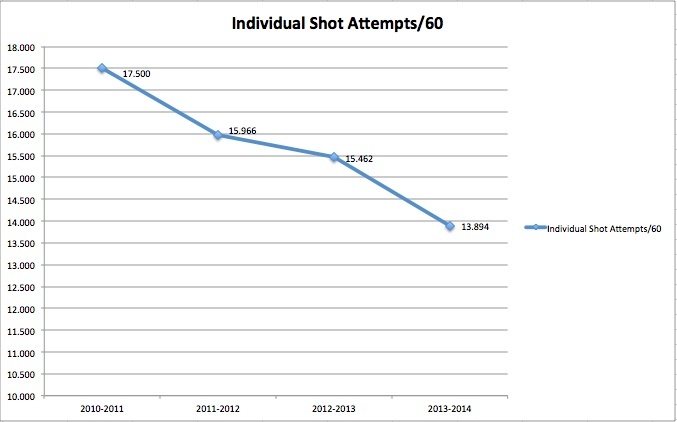 In addition to Franzen’s shot location changing, Franzen’s average shots attempted has also dipped significantly. Below you’ll see a graph of Franzen’s individual shot attempts per 60 minutes over the last four seasons. From this graph we can see that Franzen’s simply not shooting the puck. In 2010-2011, Franzen averaged 17.5 shot attempts per 60 minutes. This past season, that number dropped all the way to 13.894, the lowest total he’s had since prior to 2007-2008. As Franzen’s shot attempts fell, his zone adjusted Corsi For% saw a similar drop. In 2011-2012, Franzen’s zone adjusted Corsi For% was 57.6%, a figure that ranked in the top-20 in the entire NHL for players that played more than 300 minutes. In 2013-2014, his zone adjusted Corsi For% fell to 51.8% which again would be the lowest figure he’s had since prior to 2007-2008. Franzen simply has to get back to shooting the puck. He may be more inclined to if the Wings can find the right line combinations for him. Last season, Franzen was involved in several different line combinations. Below is a table showing all line combinations involving Johan Franzen that were on the ice for 15 5-on-5 Corsi events or more. After examining the data, it’s tough to make any concrete conclusions because the sample size is so small, but we can say that Franzen performed better when he was paired with either Pavel Datsyuk or Gustav Nyquist. Datsyuk and Nyquist are both special players who require the defense’s attention, allowing Franzen time and space. Babcock and his staff would be wise to maximize the amount of time Franzen spends on the ice with Datsyuk and/or Gustav Nyquist. In 2011-2012, Datsyuk was on the ice with Franzen for 57.6% of his minutes. This season, that number dropped dramatically, due in large part to Datsyuk’s injuries. This past season, Nyquist was on the ice for 43.0% of Franzen’s shifts, again largely due to the fact that he didn’t join the team until mid-November. If either Nyquist or Datsyuk are able to be on the ice for greater than 55.0% of Franzen’s shifts, I think he’ll be back in business. In a prior article, I reviewed all of Detroit’s line combinations used and projected Franzen to be on a line with Nyquist and Stephen Weiss. This line combination should help maximize Franzen’s performance. In addition to finding the right line combination for Franzen, the Wings should be mindful of Franzen’s zone starts and the quality of competition he faces. Below is a chart obtained from Extra Skater showing player usage for the Red Wings last year. In this image, we can see that Franzen faced the 3rd toughest competition out of all Wings’ forwards, behind only Datsyuk and Zetterberg. The Wings might be better served by protecting Franzen and deploying him against a slightly weaker level of competition. The Wings should consider deploying him in scenarios where the matchup is favorable for him. 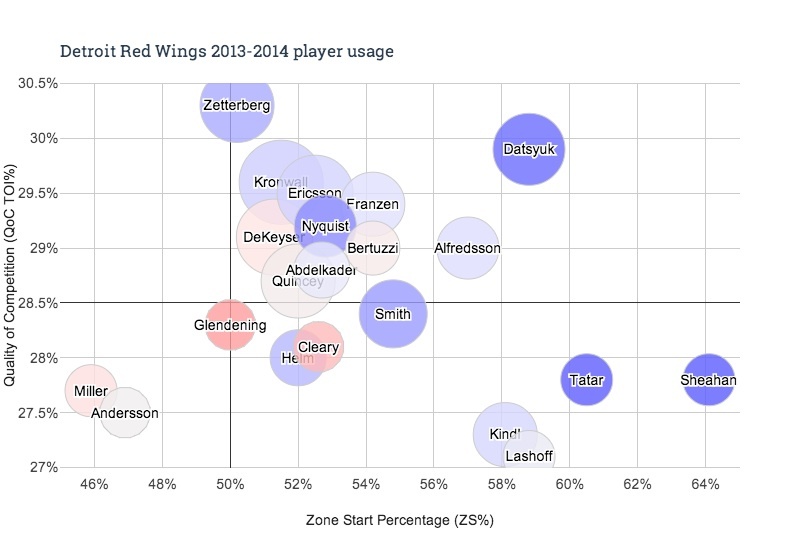 In addition, the Wings can consider having Franzen start a higher percentage of his shifts in the offensive zone. This past season, Franzen started 28.5% of his shifts in the defensive zone. That figure is higher than most of the other top forwards such as Pavel Datsyuk (26.5%) and Riley Sheahan (25.6%). By contrast, Tomas Jurco started just 21.8% of his shifts in the defensive zone and was able to start 44.5% of his shifts in the offensive zone. We know that Franzen’s skating ability has diminished significantly over the past few years so the Wings would be wise to unleash Franzen more frequently in the offensive zone and give him more opportunities to score. 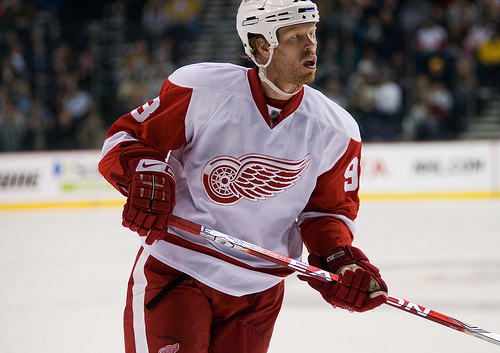 Johan Franzen is not a lost cause as many fans have suggested. He is two years removed from a 29-goal season. Back in March of this year, he was named the NHL’s first start of the week for scoring three goals and five points to lead the Wings to two crucial road victories. We all remember his past exploits, including his incredible six-point game against the San Jose Sharks in the 2010 playoffs and the amazing five-goal performance against Ottawa in 2011. Who can forget about the spring of 2008 where Franzen scored 13 goals in 16 playoff games, including this gorgeous hat trick. The “Mule” is truly a gifted player and Wings’ fans would be unwise to quit on him. He is obviously frustrated along with Babcock and just about everyone else in Detroit. However, there are a few things that Babcock and Franzen can do to alleviate this frustration. Franzen has to get back to shooting the puck and moving towards the high traffic areas in front of the net. At the same time, Babcock should be mindful of his linemates as well as the level of competition Franzen is utilized against and where Franzen starts his shifts. Time is running out, but this “Mule” should still have a few kicks left.